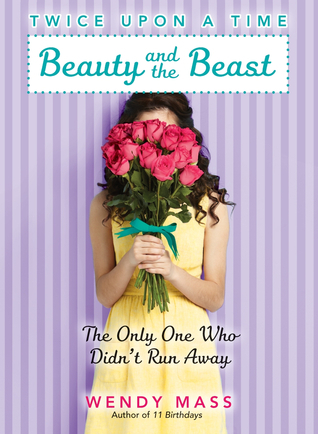 SUMMARY: Riches-to-rags Beauty meets prince-turned-beast Riley in this flipped version of Beauty and the Beast. Chapters alternate between Beauty and Riley's viewpoints. REVIEW: Let's just say I didn't love it or hate it. On the plus-side, upper-elementary and middle school readers will probably eat this book up. Wendy Mass is ever-popular in my library, as are fairy-tale retellings. Mature content is nearly non-existent; I am comfortable recommending Beauty to readers of any age who are able to read it. I also love the way Beauty's and Riley's take their unfortunate circumstances in stride. Both families deal with some serious adversity, and both families immediately circle the wagons to protect their own. Riley's family remains positively chipper about their son being turned to a beast for no apparent reason while they themselves become completely invisible to everyone except Riley. While Beauty's family lost everything in a fire, Beauty and her sister Clarissa miss their formerly lavish lifestyle but quickly learn to move on. All the characters complain a little bit but quickly focus on finding solutions. Pacing is my biggest complaint with this one. It takes FOR. EV. ER to get to the actual Beauty and the Beast story, which finally starts after 200 pages. In the meantime, Beauty gains and loses several jobs, makes two friends, and goes on a long and meaningless quest to find a missing necklace. Before he meets Beauty, Prince Riley attempts to find a cure for the curse while his family makes jokes and tries to keep Riley's spirits up. It all just really takes too long; there are just too many pieces and not enough story. THE BOTTOM LINE: Though pacing is a problem, I believe Beauty will be popular in my library. My girls especially love Wendy Mass, and fairy tale retellings are always a huge hit. It's not the best example of its genre, but Beauty definitely has its audience. STATUS IN MY LIBRARY: On order. They'll definitely check it out, but the real question is, will they finish it?